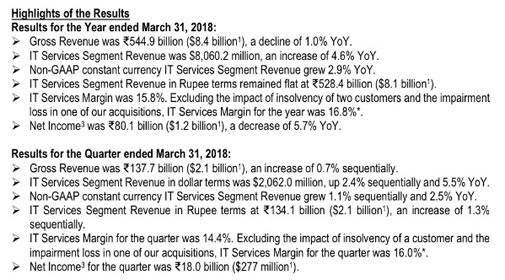 The much awaited financial numbers from the third largest Indian IT giant, Wipro, have fallen short of analyst and market expectations, be it in terms of revenue growth or the margins. 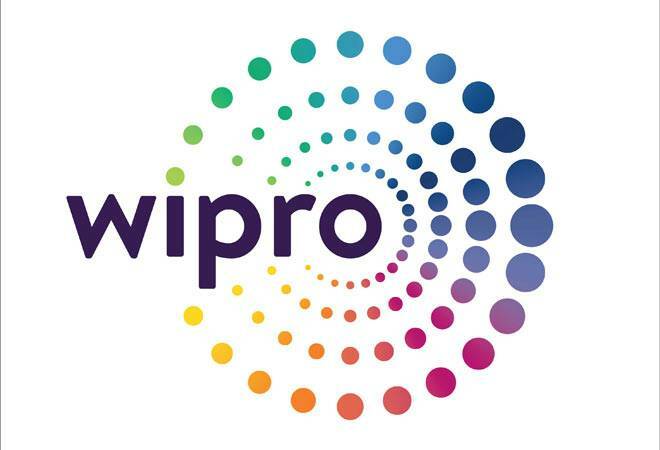 The much awaited financial numbers from the third largest Indian IT giant, Wipro, have fallen short of analyst and market expectations, be it in terms of revenue growth or the margins. Analysts believe that there are hardly any positive takeaways from the numbers, apart from glimpses of some good performance in select verticals and geographies. Sudheer Guntupalli, analyst at Ambit Capital, who was expecting the company to post better numbers feels it was a disappointment across the board. This, he says, is despite the CEO guiding that the company will exit FY18 with growth rate matching industry rate. Then, the company had some one-offs in terms of impairments. In the results, the company points out, "For the year, we recognized provisions totalling Rs 5,255 million ($81 million) with respect to insolvency of two customers and impairment loss of one of our acquisitions. For the quarter, we recognized provisions totalling Rs 2,080 million ($32 million) with respect to insolvency of a customer and the impairment loss in one of our acquisitions." Analysts are also unhappy with the IT services margin of 15.8 per cent, adjusted for the impact of insolvency of two customers and the impairment loss in case of one acquisition. Excluding these factors, the IT services margin that the company reported for the year were at 16.8 per cent. The analysts also seem to find the guidance for the next quarter muted and this seems to have added to the overall disappointment. However, it adds, "We had announced the divestiture of our hosted data centre services business to Ensono for a consideration of $ 405 million. We expect the transaction to complete during the quarter ending June 3, 2018. For the purpose of the Outlook , we have not considered the impact of the divestment on the revenue for the quarter ending June 30, 2018. We will revise the Outlook for the quarter based on the actual date of completion of the divestment." Madhu Babu, analyst at Prabhudas Lilladher, too, hoped to see more organic growth happening in the company. He is finds the numbers overall disappointing. However, the good news for the company has been the good performance of select verticals like the BFSI, and in select geographies like Europe, where sequential growth was shown. There is also some comfort in terms of valuation, says Sandip Agarwal from Edelweiss, though he feels the numbers are a bit disappointing.